Imagine if the ACC suddenly decided to cancel its preseason media gatherings for football and basketball. The media interview the coaches and select players from each league school at the events and get information for numerous season preview packages. That’s not going to happen even though both ACC sports would get plenty of publicity without it. Most reporters thought it would never happen to the NASCAR media days, a two-day event that been held for decades in Charlotte. But the gathering that usually happens this month was axed this year in a sport that probably could use the publicity. “This year, the teams preferred to have more flexibility for the preseason with hosting their own events and releasing news in January/early February vs. doing something in a 2-3-day condensed format as in the most recent years at the Charlotte Convention Center,” Scott Cooper, the vice president of communications at the Charlotte Motor Speedway, said via email. There still will be a media day in Florida the week of the Daytona 500. But many reporters in North Carolina who annually attended media days in Charlotte won’t be in Florida. The ability to talk to dozens of drivers over two days gave reporters enough material to write stories for weeks. This was a curious decision for a sport that continues to see its television ratings plummet. Daron Vaught, the producer of “The David Glenn Show,” is host for “Covering the Bases,” a USA Baseball podcast that debuts Tuesday. “They’ve experimented with the idea of a podcast before without much success finding a voice, and I proposed the idea when negotiating some other work,” Vaught, who does the play-by-play for three five-game USA Baseball series each year, said via email. Vaught offered a taste of what to expect in a short preview episode earlier this month. In the first full episode, Vaught talks with Scott Brosius, the former New York Yankee who recently took on a player development role for USA Baseball and LSU coach Paul Mainieri. College baseball will be a frequent topic on “Covering the Bases.” This fills a bit of the void left after WRALSportFan.com’s college baseball podcast ended. That podcast stopped after John Manuel left Baseball America to become a Minnesota Twins scout. “The idea is to cover a wide range, depending on what’s most pertinent,” Vaught said. After next week’s debut episode, new episodes will be available the fourth Tuesday of each month, with two episodes per month planned for the summer. John Forslund, the play-by-play voice of the Carolina Hurricanes, is the 2018 National Sports Media Association Sports Broadcaster of the Year. Ed Hardin of the News & Record of Greensboro earned the state’s sports writer honor. The honors were announced Jan. 14, and they’ll be awarded during the NSMA Awards weekend on June 22–24 in Winston-Salem. It’s a first-time honor for Forslund, who has been the TV voice of the Hartford Whalers/Hurricanes since the 1994–95 season and now, because the broadcast is simulcast, also is the radio voice of the team. Forslund also calls national games for NBC networks. Chuck Kaiton, the former radio voice of the Canes, won the 2015 award. This is the third time Hardin, a columnist, has earned the state sports writer honor. He also earned it in 2014 and 2016 (shared the second time with News & Observer/Herald-Sun columnist Luke DeCock). Hardin has been at the News & Record since 1988 and has been a columnist since 1997. It’s the first time since 2015 that an N&O writer hasn’t at least shared the honor. DeCock shared the 2017 honor with N&O colleague Andrew Carter. Four winners in other states have North Carolina ties. For the second consecutive year, UNC alum Grace Raynor is the co-sports writer of the year in South Carolina. She shares the honor this time with Manie Robinson of the Greenville News. Raynor covers Clemson for the Post & Courier of Charleston and got the news exactly one week after covering the Tigers’ victory over Alabama in the CFP national championship game. UNC alum Mike Waters, who covers Syracuse men’s basketball for the Post-Standard, won sports writer honors in New York. The day that was announced, he was in Durham to cover Syracuse’s upset victory at then-No. 1 Duke. It was the second time since 1959 that a sports writer outside of the New York City market won the award and first time since Steve Weller of the Buffalo Evening News earned it in 1970. Waters has covered Syracuse and college basketball for 30 years. Duke alum Barry Svrluga, a Washington Post columnist, earned sports writer honors for the District of Columbia. Svrluga, who also won the award in 2015 and 2016, has been at the Post since leaving The N&O after 4½ years in July 2003. Former Fayetteville Observer writer David Teel, a longtime columnist at the Daily Press of Newport News, Va., won the Virginia sports writer award for the eighth consecutive year and the 12th time overall. He covered N.C. State’s run to the 1983 national championship for the Observer. If you’re reading this, sports media must interest you. If that’s the case, you should listen to the WRALSportsFan.com’s weekly “Topics & Takes” podcast. This is the second iteration of the podcast, which was an entertaining hour in its first year with Lauren Brownlow and Marilyn Payne giving opinions about sports topics and pop culture. In the current format, which started in August, Brownlow is the sole host and the format is very different. A sports-media person is a guest each week. With a conversational style, the interviews give listeners interesting insights on the guest and their background, and always produces some good behind-the-scenes stories. Brownlow, a former co-host for “The Morning Show” on Buzz Sports Radio, covers the ACC for WRALSportsFan.com and appears regularly on two of Capitol Broadcasting Company’s two sports radio stations. Her podcast is a bit like a local version of Richard Deitsch’s sports media podcast for The Athletic (when it isn’t a roundtable discussion episode) or Jeff Pearlman’s “Two Writers Slinging Yang” podcast. Three of Brownlow’s guests were also the main subjects of past Media Musings columns: Wes Durham (the voice of the Atlanta Falcons and ACC TV broadcasts), Sara Civian (the Carolina Hurricanes beat writer for The Athletic) and Adam Gold (co-host of “Adam and Joe” on WCMC, 99.9 The Fan). Two guests are 2018 NSMA honorees in Teel and Raynor. 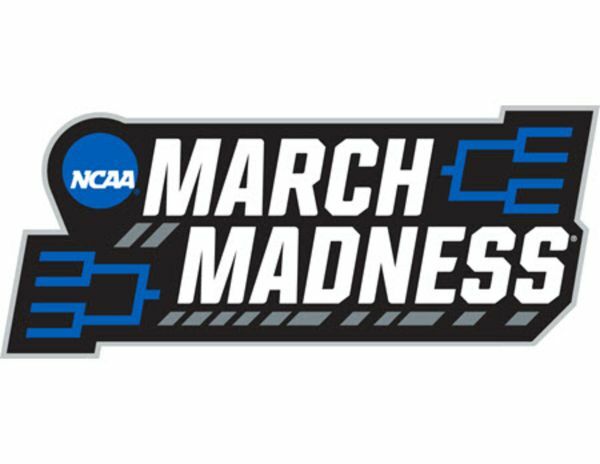 Others who have been on include Chris Kroeger (first-year radio voice of the Charlotte Hornets), Brenden Whitted (co-host of the “Out of My League” podcast) and former Herald-Sun sports writer and unofficial N.C. State historian Tim Peeler. 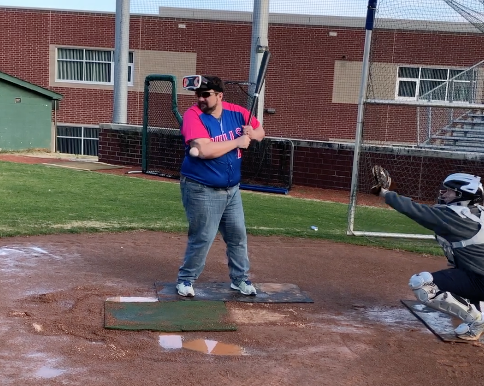 In addition, Hayes Permar, Weather Moose and Ben Swain of SportsChannel 8 have been guests. It usually is available for download by Friday (and sometimes earlier) each week and airs commercial-free on WCMC (99.9 the Fan) Saturday mornings at 9 o’clock. 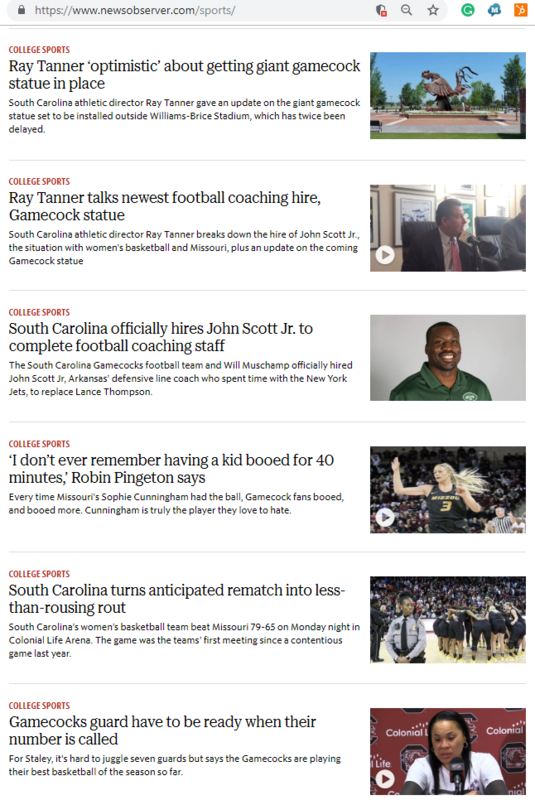 If you call up the sports web page on The N&O or Herald-Sun websites, many days you’ll see multiple South Carolina sports stories in the stream of links underneath the featured content. Digital readers often read stories off social-media links. But readers who go to the website could find some stories of local interest further down in the site’s promotion because of this trend of publishing a few South Carolina stories on those websites. One day recently, 11 of the 20 stories on The N&O’s sports web page were South Carolina-related. The reverse isn’t true with The McClatchy Company’s website for The State of Columbia, S.C. Rarely do you see similar numbers of North Carolina sports stories on that site. On that same day, there were some North Carolina-related photo galleries on The State’s sports web page but no North Carolina-related stories. In The Players Journal, Stephen Curry wrote about the feeling as a kid that he was a failure, then how experts and fans have underrated him over the years. That continued when Virginia Tech only invited him to join the team as a walk-on. He’s starting a camp for prospects who aren’t four- or five-star players, which he also was not. * Retired sports writer Dan Collins, who covered Wake Forest at the Winston-Salem Journal for years, wrote in his My Take on Whatever blog about how it reminded him that the outcome of a game can still get him riled up. Who knew that NBA players love pedicures? In The Washington Post, Candace Buckner wrote about this phenomenon. On board with this is the Miami Heat’s Wayne Ellington, a former UNC star. Nathan Rush of Athlon Sports came up with a list of the 70 best two-sports athletes of all-time, and it includes nine athletes with North Carolina ties. UNC alum and former N&O intern Blake Richardson wrote in the Los Angeles Times about UCLA gymnastics sensation Katelyn Ohashi.